The Official Sugar Conference returns to Dubai this year, taking place at The Grand Hyatt Hotel from the 8th - 11th February 2014. Over 45 countries will be present at the 10th Anniversary Sugar Conference and as the tradition continues, Al Khaleej Sugar will be hosting the event alongside Kingman-Platts. It is expected that around 650 key players from the sugar industry will be present at this year’s gathering. Al Khaleej Sugar (“The Gulf Sugar”) is the only sugar refinery in the GCC region to refine fine and coarse sugar and distribute more than a million ton to the international market each year. They have been a part of the Dubai Sugar Conference since its conception in 2005 in partnership with Kingsman, an industry leader in providing key analytics and prices to the sugar and biofuels markets. In 2005 there were only 50 participants, today there are over 650 participants and the conference is considered to be one of the key industry global events for the sugar industry. “We are proud to be a part of this revolutionary international sugar conference and we are looking forward to our 10th anniversary edition. This event attracts the who’s who of the Sugar Industry and key players of this field can be found attending the event. The conference not only attracts people to exchange ideas but it is also used as a platform for the participants to work on their budgeting and planning for the year ahead. It is a privilege to be a part of this opportunity to share our vision and ideas with our peers on a global scale, this year will be different for Al Khaleej Sugar as we are looking forward to reflecting over the last ten years and celebrating the progress of this conference”. The annual Dubai Sugar Conference provides guests a platform to discuss and develop new ideas while expanding their network that is growing rapidly every year. As always a diversity of the global sugar market will be discussed at the Sugar Conference. Sugar profitability means global sugar surplus will continue. From another side, The Director of Agriculture in Kingmsan- Platts, Mr Jonathan Kingsman, said that in India the high cane price and low arrears (delay in cane payment) encouraged farmers to persevere with planting cane. The revenue for producers has undeniably fallen but in Brazil, the world’s biggest sugar producer and exporter, the Real has weakened by almost 20 per cent since the beginning of last year. World prices have fallen to new lows around 15c/lb but in Brazilian Reals exporters are receiving R$37-38/lb. This is a higher price then what they were getting in May last year when the market was still above 17c/lb. “The next six months are a key planting period in the northern hemisphere. The direction prices take will influence farmers’ planting decisions” Mr Kingsman said. These issues and other pertinent industry topics will be discussed on 8th to 11th February at The Sugar Conference, Dubai. Held at the Grand Hyatt Dubai, the world’s premier sugar conference will share the expertise and opinions of international specialist speakers and panelists as well as offering a Sugar Learning Curve workshop designed for different levels of industry skills. Al Khaleej Sugar is the world’s largest stand-alone sugar refinery. Based in Jebel Ali Dubai, the award winning sugar refinery first began production in July 1995. Founded by the Managing Director Mr Jamal Al Ghurair. 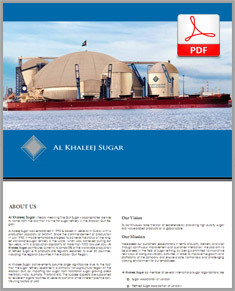 Al Khaleej Sugar is a member of many international sugar organizations like the Sugar Association of London. They currently employ over 800 personnel.